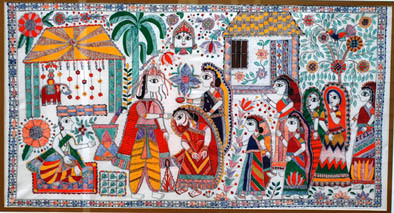 Sunanda Sahay specializes in a style of folk painting originating in the Madhubani region of North India. Practiced for centuries, this style of painting is still practiced in the villages found in the foothills of the Himalayas bordering Nepal. It is a living art and one can see murals on the clay walls of Madhubani village homes today. Most paintings depict scenes from the two great Indian epic poems - the Ramayana and the Mahabharata - as well as scenes from nature, festivals, and rituals. Sunanda grew up in the heart of the Madhubani region. Artistic interests led her to seek out practitioners of the art from local villagers and learn directly from them. Though a few male artists have received renown in recent years, Madhubani paintings have customarily been practiced exclusively by women. Sunanda Sahay has exhibited her paintings and given workshops at area museums (Museum of Fine Art, Peabody Essex Museum, Fitchburg Art Museum, Danforth Museum) and at local libraries in Lexington, Concord, and Acton. It was at the Acton Library that Madhubani painting collector Joseph Demb found Sahay's work on display. "Walking into the room where the paintings were hung was a startling experience. This was the real thing, done in monumental size, and with utter conviction and clarity." In 2010, Sunanda Sahay was named an MCC Finalist in the Traditional Arts.